Recently I was asked to produce a Whisky Ice Cream for 300 people attending the inaugural dinner of the Robert Burns World Federation. Dignitaries from around Ayrshire and beyond attended the event at Greenwood Academy in Dreghorn on Saturday, 13th Sept 2014 after holding their AGM and conference in the Menzies Hotel in Irvine. North Ayrshire’s Facilities Manager, Ken Campbell, asked me to prepare a Whisky Ice Cream of my own choosing for the occasion so it had to be something special. I’m slowly getting to grips with the complexities of the many fantastic whiskies out there but this was the first time I’d tried mixing it with ice cream. After discussing some options with one of the ice cream industry’s advisors, I personally decided on the Bowmore 12YO Malt from Islay. The late, great whisky writer, Michael Jackson, proclaimed it as “remarkably long and complex.” For me, that was exactly what I wanted to achieve with my ice cream; a taste sensation that really lingered. I wasn’t disappointed. 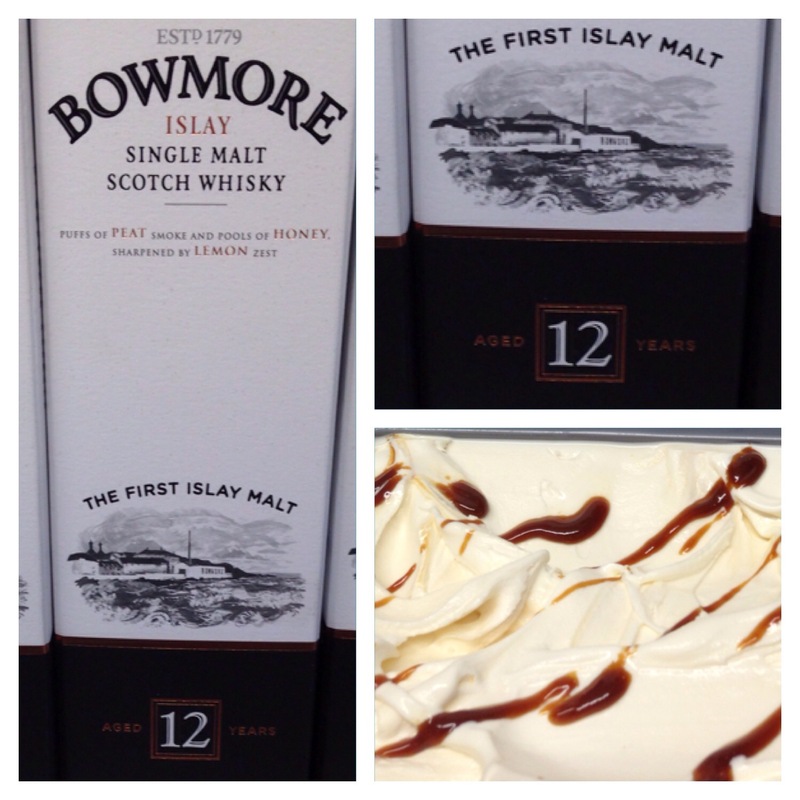 Even the distillery, one of the oldest in Scotland, say their Bowmore 12 YO is like vanilla ice cream at a beach bonfire. I couldn’t have got a better combination. My ice cream is almost 10% full cream and I needed something to cut through that without being too overpowering. Bowmore’s trademark peaty smokiness balanced with a subtle taste of honey and lemon was ideal. The end result was a very intensely whisky flavoured ice cream (4% alcohol) with a light ripple of caramelised whisky sauce. After posting some pics and and tweets of the resultant flavour, I have to say that customers have responded with requests for more, more, more! It’s been on sale in my cabinet (at no extra cost) for the last few days and has been a huge success. This one’s adults only of course (sorry kids) but has inspired me to try some more combinations as we start to go into the autumn/winter. Any suggestions?